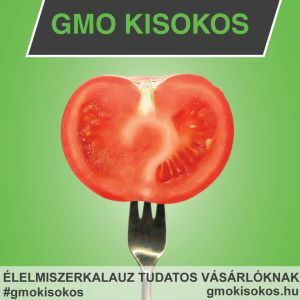 Thousands of people downloading and sharing a GMO-free consumer guide helped pressure Hungarian companies to come clean on their supply chains. Genetically modified (GM) food is banned in Hungary but many of the country’s food producers aren’t transparent regarding their supply chains. As a result, imported ingredients used in Hungarian food and beverages could contain genetically modified organisms (GMO) without consumers knowing. Wanting companies to launder their supply chains, Greenpeace Hungary spent seven months contacting companies and asking them to make a public statement that their products were GMO free. The answers were developed into a free consumer food guide that was shared offline and available online and for download. Products with a green label were safe. Red products were questionable, and implied the company didn’t respond to Greenpeace’s multiple queries. In order for the consumer guide to truly pressure companies to clean up their supply chains, Greenpeace Hungary knew it would need to reach as many Hungarian consumers as possible. That’s where testing and a unique Facebook approach would come in. Using the software Unbounce, digital campaigner Tomas Kovacs created two landing pages promoting the new Greenpeace GMO free consumer guide. People were invited to download the consumer guide once they entered their e-mails. The e-mail ask would allow Greenpeace an opportunity to communicate directly with people interested in the issue of GMO, and provide updates when companies agreed to work with Greenpeace, and publicly ensure their products were GMO free. Page A had a lengthy explanation about the threats GMO food pose to people’s health as well as the planet. Page B was simpler, sharing the new consumer guide without explaining the risks of GMO food. The simpler landing page resulted in 20 per cent higher downloads of the consumer guide. “I see testing as absolutely essential, “says Tomas, who first read about the benefit of Unbounce in a blog post, and decided to try it out. He adds Greenpeace Hungary conducted many other tests, but this was the most significant finding. While Unbounce is a simple site to use, the results are based on statistical significance, which can be difficult to determine depending on the sample size and results. In the case above, the testing software stated the 20 per cent difference was statistically significant. While most campaigns create a number of Facebook posts and images to promote their issue, Tomas says the GMO campaign chose the opposite strategy. Greenpeace Hungary would develop only one post, continually promoting the post to aggregate the number of likes, shares and comments in one place. “It’s a lean model. One Facebook post, and push it as far as you can,” says Tomas, adding the approach allows the companies to see the full reach and scale of the guide. The Facebook post was optimized to spread; It was big, a square 800 by 800 pixel image with bright, engaging colors. The image included a shortened url to the consumer guide twice, as well as an arrow to click here to access the guide, and a hashtag. It was also maximized to share. “These small things can make a huge difference,” says Tomas on the time spent creating the Facebook image. The Facebook post was promoted for three weeks: initially through Greenpeace’s Facebook page, then as a promoted post to Greenpeace Hungary fans and special interest groups. Once more than 1,000 people had liked, shared or commented on the image, Tomas upgraded the post to a sponsored story, which shared the image with friends of people who liked the image. Tomas says sponsored stories are an effective way to share your campaign. “It’s very strong if people learn of a campaign through someone they know. It isn’t viewed as an advertisement,” he says. Within three weeks, the Facebook post had 9,000 likes, 627 comments and 11,327 shares, with shares being the most valued type of engagement on Facebook. “Those big numbers are scary to the companies because they see something has 10,000 shares, and they are mentioned there not in the best way,” adds Tomas. 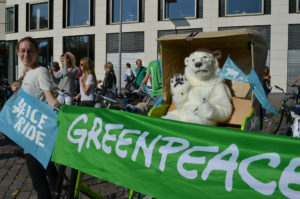 The high number of shares can in part be attributed to Greenpeace’s thank you page, which let people know the guide would arrive shortly in their inbox. In the meantime, they were encouraged to share the FB post so it could reach the hands of more caring consumers. The Facebook post would drive 30,000 views to the Greenpeace GMO Free Consumer Guide download page. This equals three quarters of all views to the campaign website. The consumer guide’s soaring popularity resulted in a rapid about-face by companies. One of the largest beer companies in Hungary committed to studying its supply chain to ensure it was GMO free after seeing large numbers of consumers downloading and liking the guide. Within two weeks, a total of six companies that had previously refused to co-operate with Greenpeace Hungary agreed to open up their supply chains. In total, 10 companies have agreed to study their supply chains to confirm their products are GMO free, and other companies are still contacting Greenpeace. 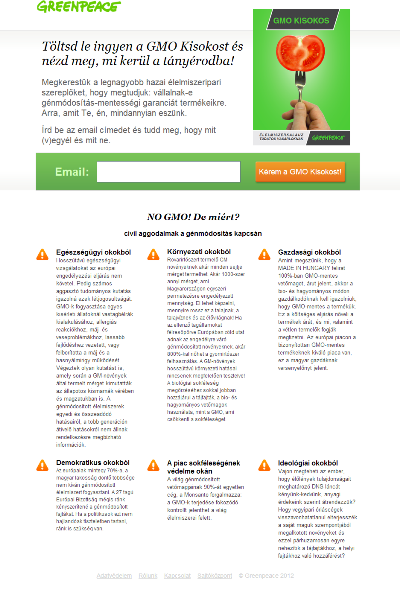 With each victory, Greenpeace Hungary sends an updated e-mail to consumers who continue to subscribe after downloading the guide — there was a clear option to unsubscribe in the initial e-mail — letting them know about the company’s new commitment. The online version of the guide is also updated to reflect Hungarian companies’ co-operation. The only glitch in this model is if a person chose to download the guide and unsubscribe from Greenpeace e-mails, they would not learn about the company’s policy change. • Keep It Simple Stupid (KISS) principle – Almost embarrassingly simple things can work better than expected. No need to over-explain or over-design. • Always Test – Test multiple landing pages and designs to discover the highest uptake. Testing of elements and designs should be done as much as possible, including for Facebook. 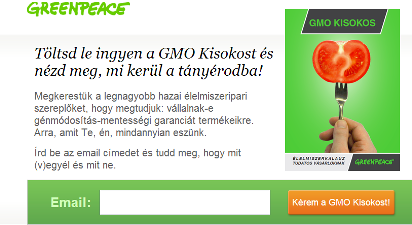 • Unique value proposition – Before creating the site, Greenpeace Hungary paid plenty of attention to the would-be headline and supporting text. They found good examples to discuss and experimented with text options. They pushed themselves to explain what the guide was for and why a visitor would want the guide in clear, simple language. The resulting few lines were solid and worth the extra effort. • Designate a “face of the campaign” – Greenpeace Hungary used a personal communications strategy, designating one campaigner to appear at the press conference, sign e-mails to supporters, and reply to Facebook comments. • One Facebook post -This allows comments, likes and shares to accumulate, demonstrating the public’s collective heft. Greenpeace Hungary admits it’s not easy to find one promotable piece but that’s the ideal case. One super hit for people to focus on is better than 10 ordinary posts. Do you have an innovation in mobilisation or people-powered campaigns? 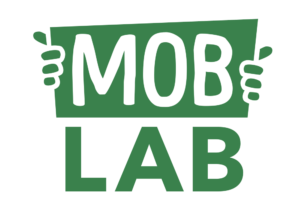 Share it with Mob Lab by contacting MobLab@greenpeace.org.